Most food studies, articles and blogs focus on WHAT we eat. There is another often overlooked factor that is equally important: WHEN. In this blog I’ll tell you the basics of time-restricted feeding. 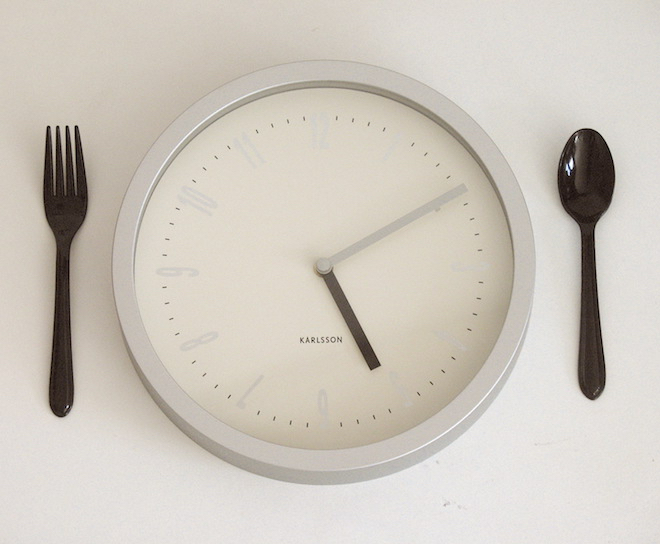 Time-restricted feeding – also known as ‘time-restricted eating’ – is a form of intermittent fasting, where food intake is restricted to an 8 to 12 hour period per day. This results in a daily fasting period of 12-16 hours. Also the eating window should fall within daylight hours. Within the eating window you can eat anything and as much as you want. Improvements in gut microbiome and reduction of irritable bowel syndrome symptoms and acid reflux. So it may be no wonder time-restricted eating also increases longevity – with similar results as caloric restriction, but much easier to maintain. Many of these effects arise with 12 hrs of fasting, some more at 16 hours. There are two main ways how time-restricted feeding causes these beneficial effects. The first way is by implementing a daily fasting period. Eight hours after your last bite the body will enter the fasting state. Fasting has many health benefits, one of which is increasing autophagy. Autophagy is a natural cellular repair process which plays an important role in increasing both health-span (healthy and functional years) and lifespan. Most likely this is because of its positive effects on mitochondria (mitophagy) and stem cells. Also autophagy plays a protective role against the effects of advanced glycation end products (AGE’s). The second mechanism of time-restricted feeding is by aligning with circadian rhythms. Like all systems in the body the digestive tract is controlled by your biological clock. In fact: each organ has its own clock. For instance the secretion of enzymes by the liver and also the activity of the gut microbiome are timed. These clocks are mostly controlled by light, but the timing of meals also plays a role. If the clocks are synchronised, digestion will be optimal. However this is a complex process that is not fully understood yet. Nevertheless this conclusion can be drawn: the body is not ready for the efficient digestion of food 24/7. The best time to eat is during the day. Historically humans didn’t have access to food 24/7. Therefore we have adapted to function well in this context. Fasting meant there was no food available and therefore triggers the body to improve cognition and vitality to be able to find food. Food was usually found or caught during daylight hours; so it makes sense the human body is designed to process food during the day. There has been a long tradition of fasting in all major religions. How to do time-restricted feeding? In its simplest form you have an early dinner and then stop eating. Eating is intake of anything but water; no exception for tea, coffee or alcoholic beverages. On top of that you can delay your breakfast, or stop eating after lunch – which is called early time restricted feeding (eTRF). At first you might feel hungry the moments that you used to eat at – and your body is expecting food – but this subsides in a couple of days. The point is not to eat differently or less, but to eat the same food within the ‘feeding window’. It is no problem to cheat 1 or 2 days a week, which allows for some flexibility in social situations. This is not recommended in the beginning however. Don’t worry, once you have incorporated time restricted eating in your daily routine, it will become a habit without much effort. As said, you can eat whatever and as much as you want within your feeding window. Needless to say that if you make good choices there and eat normal amounts, this will add to the benefits. As far as I know this can be done by anybody without risk. Make sure you don’t alter your diet adversely, by leaving out nutrients. Take care if you have a problem with blood sugar or hormone balance. In this case gradually restricting your food window – allowing the body to adapt – may be a good strategy. I’ve been eating within a 8-12 hour window since September 2016. Initially it took some effort, as I experienced hunger in the evening, but I got used to it pretty quickly. That was also because of the rapid onset of positive effects: better sleep and a clean and healthy feeling. Digesting food takes energy and it feels good to do this only a part of the day. Every now and then I eat in the evening, usually due to social factors, but this is only once or twice per month. Time-restricted feeding is one of the best ways to improve your health and longevity. This science based intervention is simple, natural and free. It is an easy way to implement fasting (with many of its benefits) in your life, but without the discomfort and with little discipline required. I expect to continue this biohack the rest of my life.